This section is from the book "An Illustrated Flora Of The Northern United States, Canada And The British Possessions Vol3", by Nathaniel Lord Britton, Addison Brown. Also available from Amazon: An Illustrated Flora of the Northern United States, Canada and the British Possessions. 3 Volume Set..
About 55 species, natives of America, South Africa and Australia, known as Tickseed. In addition to the following, some 20 others occur in the southern and western United States. Type species: Coreopsis lanceolata L.
1. Style-tips acute or cuspidate; outer involucral bracts about as long as the inner (except in C. tripteris). Leaves simple, or pinnately lobed; achenes often with a callus on the incurved inner side. Achenes with thin flat broad wings. Leaves mostly near the base of the stem, the heads long-peduncled. Glabrous, or sparingly hairy below. Stem leafy to near the shorter-peduncled heads. Pubescent or hirsute; leaves entire or with a few lateral lobes. Glabrous or very nearly so; leaves 1-2-pinnately parted into narrow segments. Achenes with thick, involute narrow wings. Leaves palmately 3-cleft or divided; achenes without callus. Leaves petioled, 3-divided into lanceolate segments, or the Upper entire. Leaves rigid, deeply 3-lobed above the base. Leaves divided to the base. Disk-flowers purple-brown; leaf-segments 1"-3" wide. 2. Style-tips truncate or obtuse; outer involucral bracts much shorter than the inner. 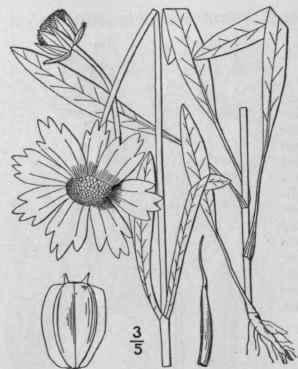 [Genus Calliopsis Reichb.] Achenes broadly winged; annual. Rays yellow with brownish bases; annual with pinnately divided leaves. Rays rose-pink, rarely white; perennial with linear entire leaves. Coreopsis lanceolata L. Sp. Pl. 908. 1753. Coreopsis lanceolata var. angustifolia T. & G. Fl. N. A. 2: 344. 1842. Perennial; stem slender, glabrous, or sparingly hispid near the base, 1°-2° high. Leaves glabrous, the lower and basal ones slender-petioled, spatu-late or narrowly oblong, very obtuse, 2'-6' long, entire, or with 1-3 lateral obtuse entire lobes; stem leaves few, sessile or nearly so, lanceolate or oblong, obtuse or acutish, usually quite entire; heads few or solitary on elongated slender peduncles, 1 1/2'-2 1/2' broad, showy; peduncles often 12' long; involucre depressed-hemispheric, its bracts glabrous or ciliate, lanceolate or ovate-lanceolate, the outer narrower than the inner, but nearly as long; rays 6-10, bright yellow, cuneate, 3-7-lobed; achenes oblong, broadly winged, about 1" long; pappus of 2 short teeth. In dry or moist soil, Ontario to Virginia, Michigan, Illinois, Florida, Louisiana and Missouri. Escaped from cultivation eastward. May-Aug.